What Are the Benefits of Attending a Clinical Genetics Service (CGS)? Are There Patient Benefits to Be Derived from Using a CGS? Does Attendance at CGS Empower Patients? How to Interpret Human Rights? Engaging Children: Was it Successful? Introduction: The Life Costs of Rare Diseases? So, How Can Genomics Help? What Are the Key Future Targets for Genomics-Assisted Crop Improvement? What Will Be the Future Trend of Consanguinity in Highly Consanguineous Populations? Why Are Consanguineous Marriages Preferred and Respected in Some Populations? Does Consanguinity Minimize Intimate Partner Violence? Ruth Chadwick is Distinguished Research Professor and Director of the ESRC (Economic and Social Sciences Research Council) Centre for Economic and Social Aspects of Genomics (Cesagen), at Cardiff University, UK and Link Chair between Cardiff Law School and the School of English, Communication and Philosophy (ENCAP). Professor Chadwick has coordinated a number of projects funded by the European Commission, including the EUROSCREEN projects and co-edits the journal Bioethics and the online journal Genomics, Society and Policy. She is Chair of the Human Genome Organisation Committee on Ethics, Law and Society, and has served as a member of several policy-making and advisory bodies, including the Panel of Eminent Ethical Experts of the Food and Agriculture Organisation of the United Nations (FAO), and the UK Advisory Committee on Novel Foods and Processes (ACNFP). She was editor-in-chief of the first edition of the award winning Encyclopedia of Applied Ethics. She is an Academician of the Academy of Social Sciences and a Fellow of the Hastings Center, New York; of the Royal Society of Arts; and of the Royal Society of Medicine. In 2005 she was the winner of the World Technology Network Award for Ethics for her work on the relationship between scientific developments and ethical frameworks. She graduated with first class Honours Literae Humaniores (Philosophy and Greek and Latin Literature) from the University of Oxford, and then went on to take the B.Phil. in Philosophy. She was awarded her D.Phil. 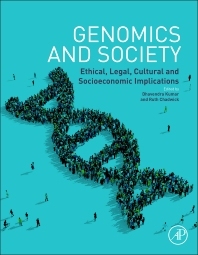 on The Ethics of Eugenics and Genetic Engineering, supervised by Jonathan Glover. She completed an LL.B. (externally) at the University of London. She held positions at the University of Liverpool, St. Martins College, Lancaster, and University of Wales, Cardiff, before taking up her post as Professor of Moral Philosophy at the University of Central Lancashire. In June 1995 she became Head of the Centre for Professional Ethics at the University, a position she still holds. She has coordinated a number of multinational and multidisciplinary research projects funded by the European Union: Ethical Implications of Human Genome Analysis for Clinical Practice in Medical Genetics, with Special Reference to Genetic Counselling (1992); EUROSCREEN: Genetic Screening--Ethical and Philosophical Perspectives (1994–1996); BIOCULT: Cultural and Social Objections to Biotechnology, with Special Reference to the View of Young People (1995); EUROSCREEN 2: Genetic Screening--Towards Community Policy on Insurance, Commercialisation and Public Awareness (1996–1999). Her publications include the four volume edited collection, Kant: Critical Assessments (1992); Ethics, Reproduction and Genetic Control (Revised Edition, 1992);and a large number of papers in learned journals. She is joint series editor of the Routledge series on Professional Ethics. Professor Chadwick is secretary of the International Association of Bioethics and a member of the HUGO Ethics committee, the National Committee for Philosophy and the British Medical Association Steering Group on Human Genetics. Department of Bioethics, Lancaster University, Lancaster, U.K.